For decades, designers who wanted to engage in graphic agitation had an almost unvarying recourse: they poured their passion into a poster. Competitions were organised, sometimes annually, to encourage design stars to make their graphic comment for a worthy cause. However well this may have worked as a strategy in the past, it is hard to believe that a stand-alone image, no matter how fiercely executed, can have much impact in today’s media landscape. It’s like tossing a pebble into the ocean: the splash is overwhelmed by the waves. So what should a graphic agitator do? Is graphic activism in support of unpopular causes feasible any more? A telling example of what can be accomplished, with some media-conscious lateral thinking, comes in the shape of Friends of the Earth’s contribution to ‘International No Shop Day’ on 29 November last year  – devised by Kristine Matthews of the Royal College of Art’s Environment Programme and Sophie Thomas, a designer at The Body Shop. All images: Installation by Sophie Thomas and Kristine Matthews in collaboration with the Royal College of Art’s Environment Programme. Supported by the Royal College of Art and the Life Arts Research Centre at the University of Brighton. Photographs: David Spero. Asked by Friends of the Earth to come up with a poster, Matthews and Thomas replied with an ambitious proposal to take over a London retail unit and counter the pre-Christmas consumer frenzy by offering absolutely nothing for sale. 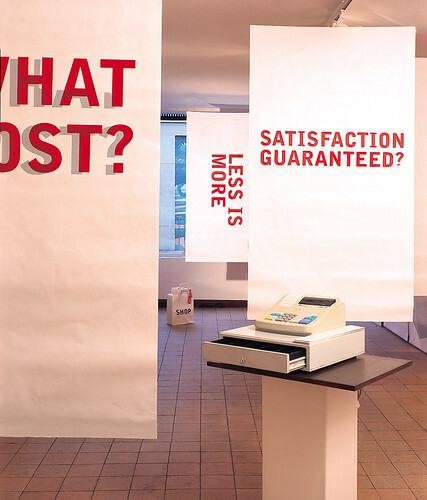 In a small south London gallery, on an ordinary shopping street, the No Shop installation used doubled-sided banners screen-printed on recycled billboard material to advertise its ambiguous message: ‘Prices slashed’ / ‘At what cost?’ … ‘You know you want it’ / ‘Satisfaction guaranteed?’ … ‘Final reductions’ / ‘Less is more’. 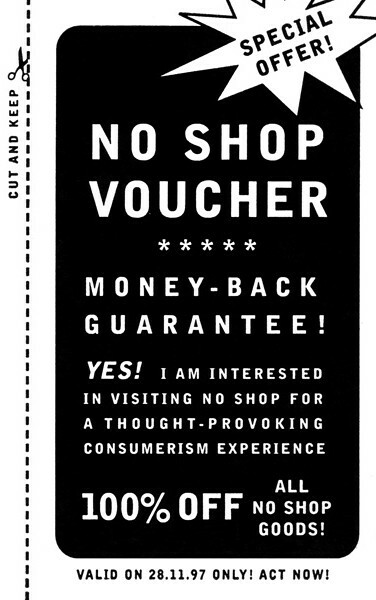 No Shop’s product-free shelves were black and white photocopies, the transaction-less till was empty of cash and Friends of the Earth’s mission statement took the form of a receipt, urging visitors not to ‘shop the planet’. The four-day installation found its way on to television and radio and into the broadsheet papers. ‘As a video image,’ says Matthews, ‘they milked it for all it was worth.’ The media coverage attracted a stampede of Non-Shoppers happy to lay down their credit cards and share jaded views of the national pastime. ‘People would come in to say: “I really like what you are doing and I think it is a great idea”, and that they were fed up with having marketing shoved down their throats at this time of year,’ says Matthews. Initially dubious about how much the untested installation approach could achieve, Friends of the Earth was delighted by its media coup. 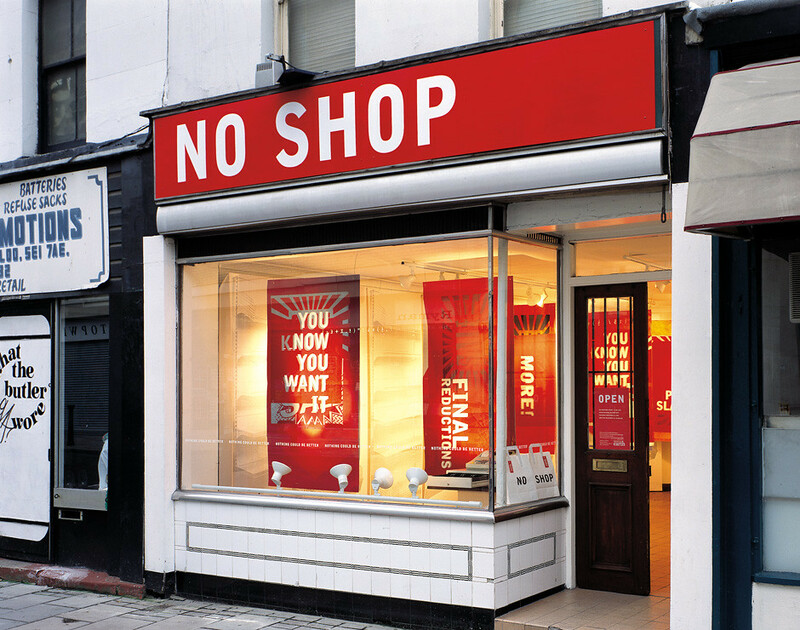 ‘International No Shop Day’ is an annual event similar to, though not linked with ‘Buy Nothing Day’ (which in North America is held on the day after Thanksgiving, 28 November last year). This was initiated by Kalle Lasn, the editor of Adbusters, the Vancouver-based leftist quarterly that parodies and criticises the ‘mental pollution’ of ad campaigns. 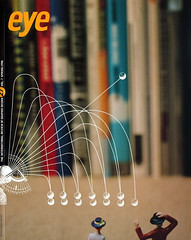 Matthews sees considerable possibilities for an internationally co-ordinated use of marketing techniques to question the assumptions of global consumerism. 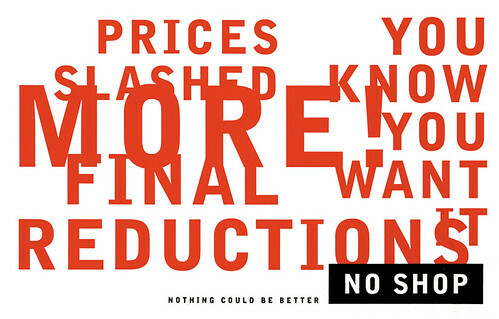 Now that would be a brand to conjure with: Nike, Benetton, Coca-Cola, Calvin Klein … No Shop.